HeinOnline contains more than 2,500 full-text journals, with most of these available through the current issue or volume and all available back to inception. 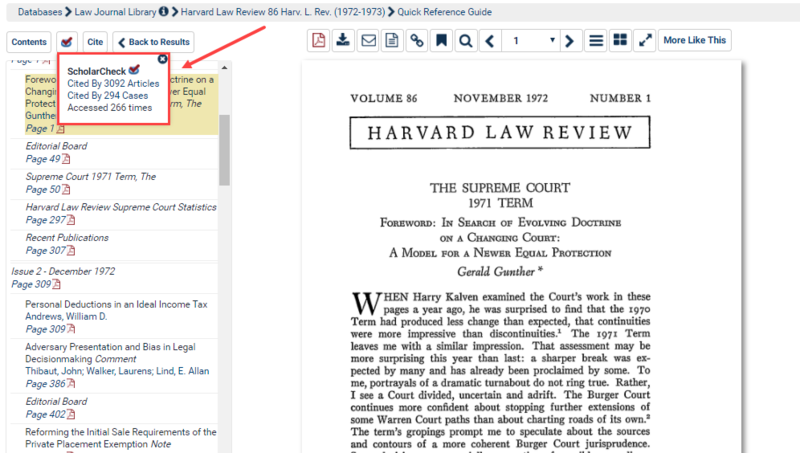 The collection homepage for the Law Journal Library displays an A to Z title index, where the title and coverage information for all titles can be found. 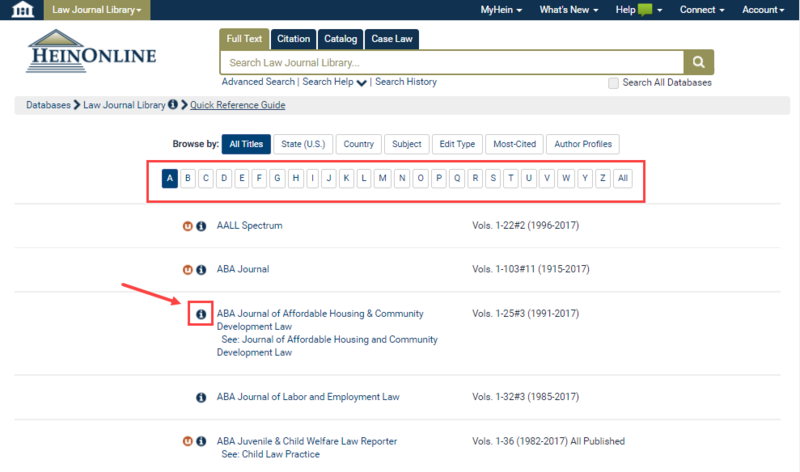 Use the more information icon throughout the Law Journal Library to learn about each title, including publisher information, HeinOnline coverage, ISSN, frequency of publication, embargo information, and more. 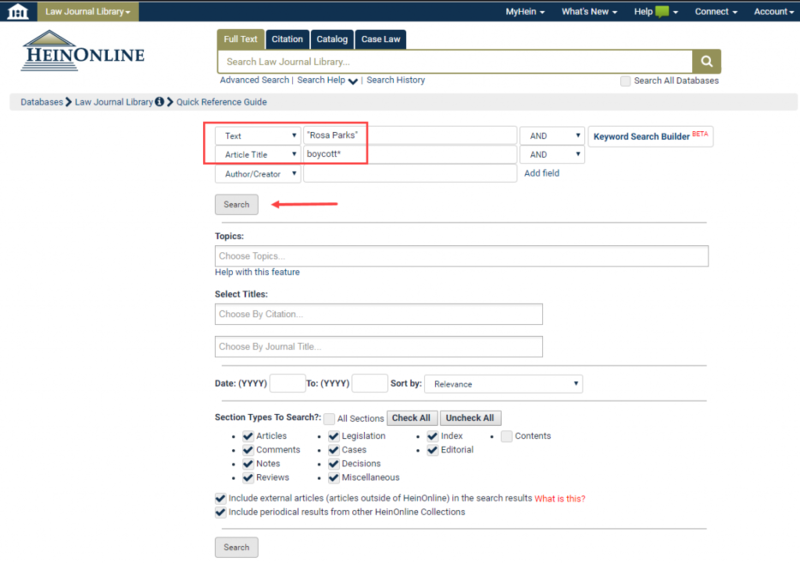 Browse journals by title, state, country, subject or most-cited using the browse options located at the top of the collection homepage. Journals are categorized at the title level. Clicking any option will display an alphabetical list of each category. For example, choose browse by Subject. This option will display an alphabetical list of titles categorized by subject. A title can be found in multiple subjects, depending upon its content. The number of titles available within each subject appears in parentheses next to the subject. Choose browse by Country or State for similar lists. Clicking any subject, country, or state opens a list of titles categorized within that option and opens a search bar which will enable you to search only journals within that category. For example, choose browse by Country and select Belgium. The Most-Cited browse option lists HeinOnline’s most-cited authors, articles, and journals. It also provides lists of the top 50 articles and top 250 authors. 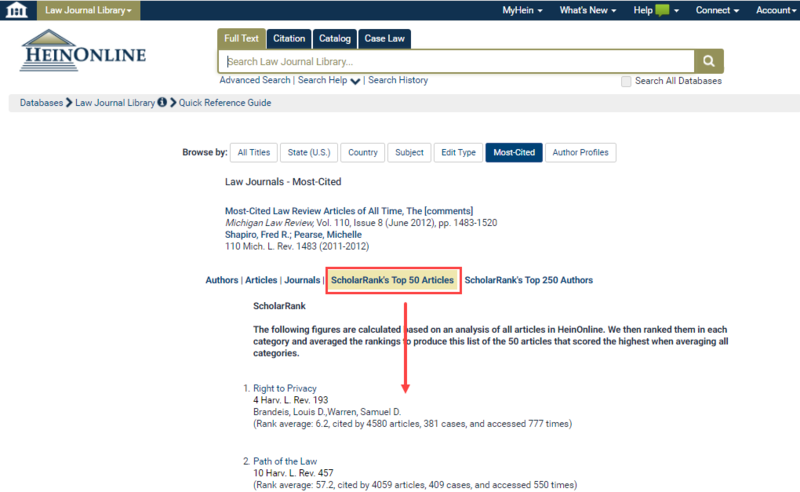 For example, choose Authors to view a list of the authors cited most by other articles in HeinOnline. Clicking the author’s name will produce that author’s profile page, which will include a list of articles he or she has written. 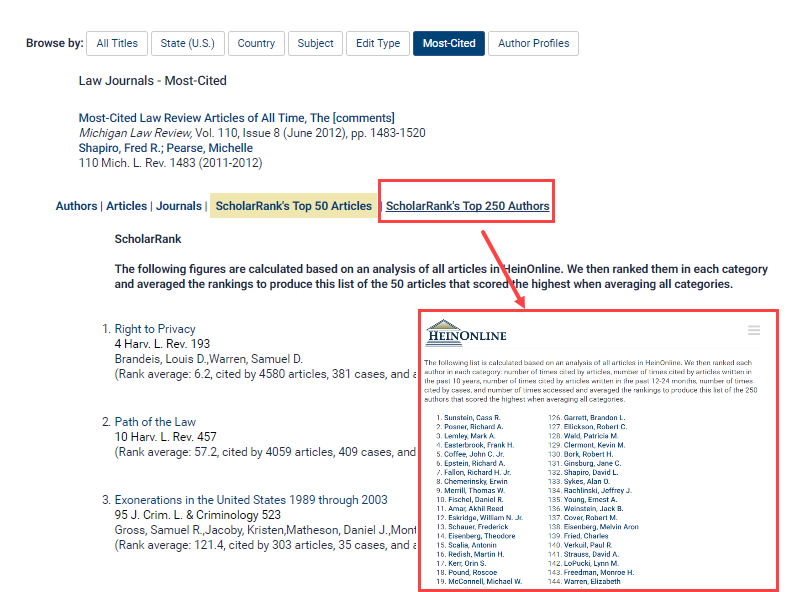 ScholarCheck’s ScholarRank tool ranks the top 50 articles and the top 250 authors in HeinOnline based on the number of times they have been cited by other articles in HeinOnline. All cited-by numbers are updated on a monthly basis. Click either link to view a list of these articles and authors. Click on any author’s name to view the author’s profile page. The main search bar is stationary throughout HeinOnline. 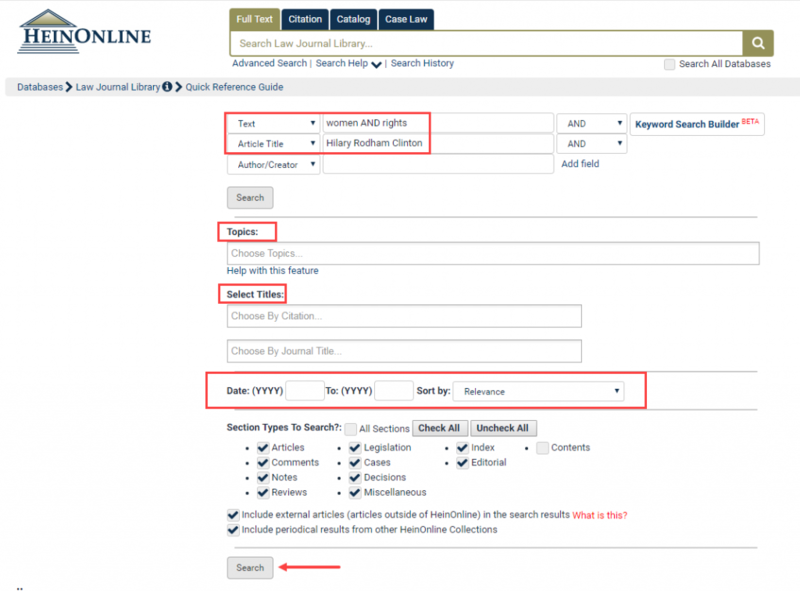 After entering the Law Journal Library, the Full Text search tab option on the search bar will search only within this database. Click Advanced Search to expand search fields or to perform a more specific or date-limited search. Click Search Help for a quick reference to commonly used search syntax. 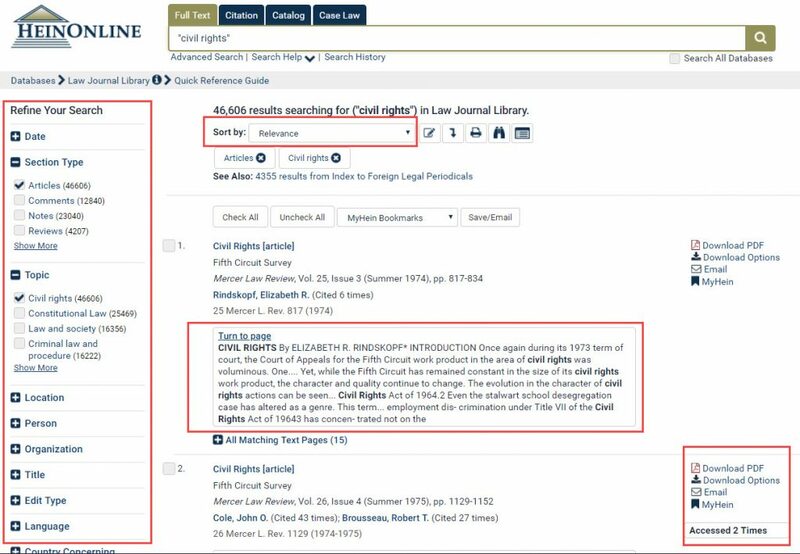 Search for articles pertaining to civil rights by entering the phrase “civil rights” inside quotation marks into the search bar. Results can be refined using the facets on the left side of the page. The search terms will appear in bold text within the matching text page snippets. Sort search results by relevance, volume date, and more. 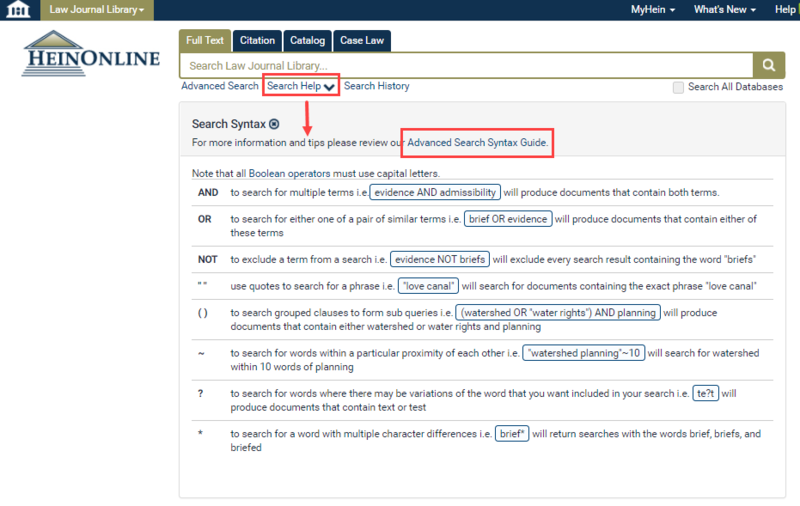 Find cited-by information and access tools, such as an instant-PDF download, on the right side of each search result. Use the icons next to the sort-by bar to modify your current search, to search within results, to toggle all matching text pages, or to turn OFF infinite scroll. Click the Advanced Search link located beneath the main search bar to expand searching options. Choose to search using various metadata fields, such as Text, Article Title, Author/Creator, and more. For example, to search for articles by Hillary Rodham Clinton that pertain to women’s rights. Enter Hillary Rodham Clinton in the Author/Creator field. In the Text field, enter the words women AND rights, using capital letters for the Boolean operator (AND). The Advanced Search option also offers the ability to perform a more specific search. Use the metadata fields to search for terms occurring specifically in the Title or Author field. Select a specific topic or choose one or more titles in which to search. Limit your date range or choose specific section types before clicking one of the two available Search buttons. Results will appear the same way using both the main search bar and the advanced search tool. Note: if utilizing the Topic field, you must fill in the Text box as well. The Keyword Search Builder is located in the Advanced Search tool. Enter keywords into one or more boxes and use the boost levels to give more weight to the most important terms in the query. Click Turn to page from any search result to access a document. Matching text will be highlighted in green within the article. The table of contents for the volume is available on the left side of the page. An image toolbar, located above the page image, provides a number of tools. For example, the red PDF icon will instantly download a PDF. The email envelope icon will enable a user to email a direct PDF link to another user. Hover over any tool for a description of its function. 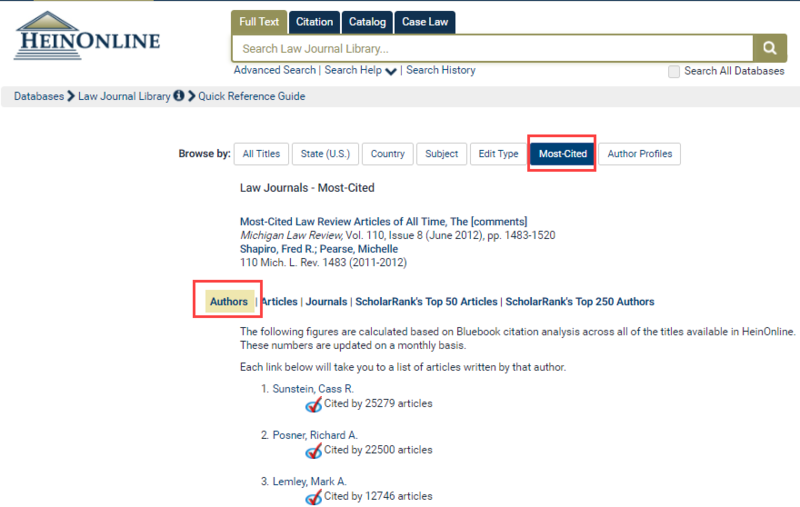 The cite button located above the table of contents provides the document’s citation in multiple citation formats including American Psychological Association (APA), Chicago, Bluebook, and recently, the Oxford University Standard for the Citation of Legal Authorities (OSCOLA). 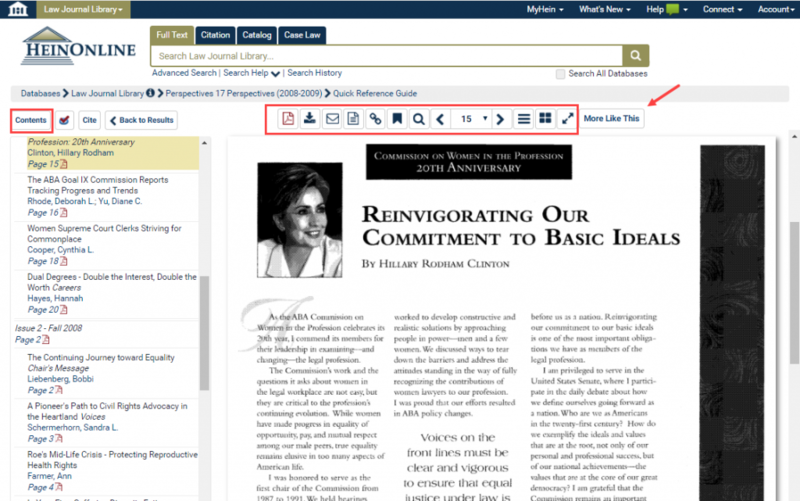 Copy and paste the citations, or export to Refworks, export RIS file, or export text file. Proper search syntax will improve search result quality. From the Full Text tab, click the Search Help link located beneath the main search bar to access commonly used search syntax. The Search Help link also contains a link to an Advanced Search Syntax Guide, which is an excellent resource for those looking for extremely detailed advanced search examples. When using either the main search bar or the Advanced Search tool, capitalize Boolean operators (AND, OR, and NOT) and ensure that phrases are contained inside quotation marks. For example, search for “Rosa Parks” AND boycott* using the main search bar. This will search for “Rosa Parks” as a phrase and variations of the word boycott: boycotts, boycotted, and boycotting. The Advanced Search tool makes it simple to perform more specific searches. For instance, search for “Rosa Parks” in the article title field, and boycott* in the text. Results will now contain only items in which “Rosa Parks” appears in the article title and boycott* in the text. 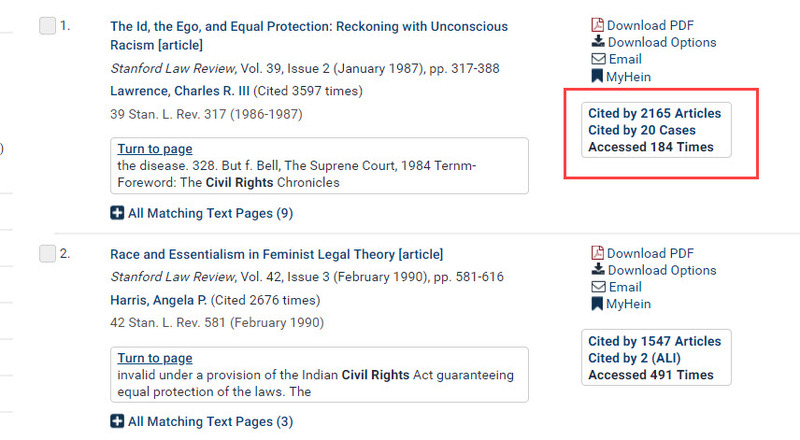 The fastest way to find an article when you have its citation is by using the Citation Navigator. 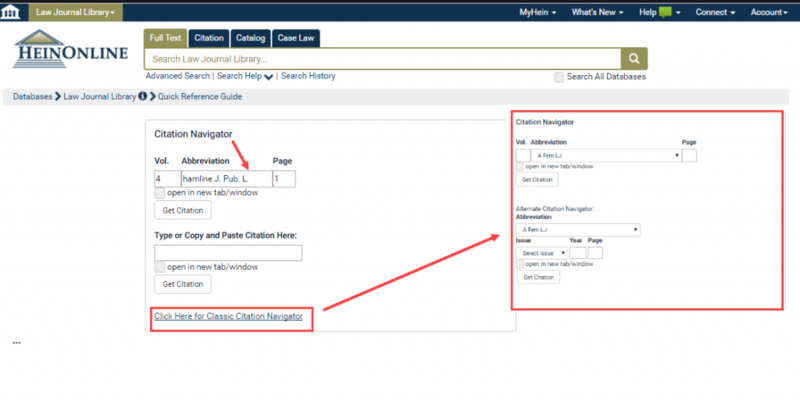 Click the Citation tab, and copy/paste a direct citation into the bar and click search. Click the Citation Navigator link beneath the main search bar to open additional options. 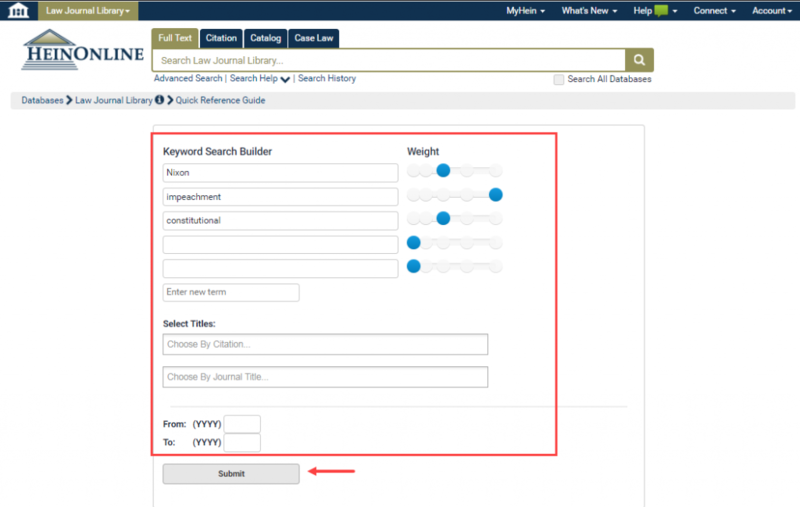 Enter a volume number and start typing a journal’s abbreviation for a convenient drop-down list of potential title matches to appear. From this area, you can also access the Classic Citation Navigator. If you are unsure of a proper citation format, click Citation Format Guide for an A-Z list of titles and their corresponding citations. Hein’s ScholarCheck is a series of tools and features integrated throughout HeinOnline. It allows users to view journal articles and cases* which have a heavy influence on the subject being researched. 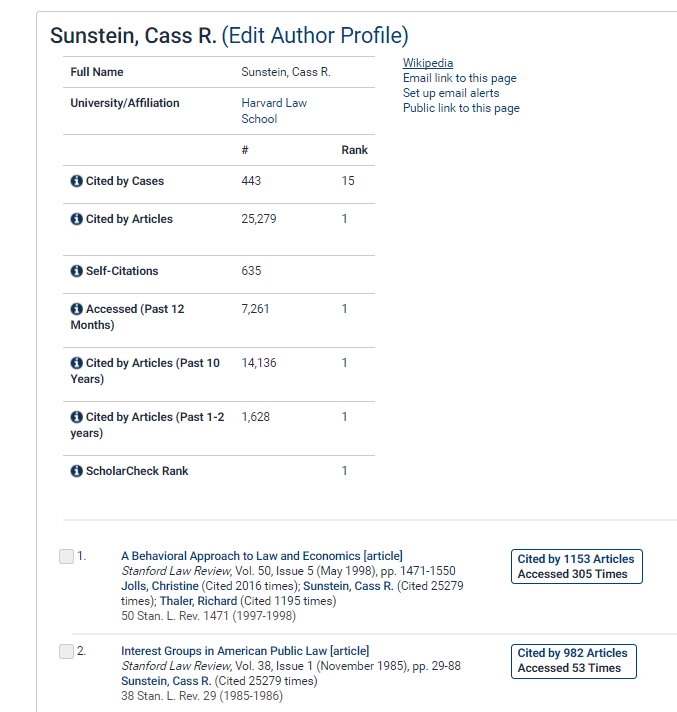 ScholarCheck also allows researchers to link to articles and other documents from the current article, shows how many articles cite articles and cases throughout HeinOnline, and shows how many times an article has been accessed by other HeinOnline users in a rolling 12-month period. Citations and websites will appear as blue highlighted hyperlinks. 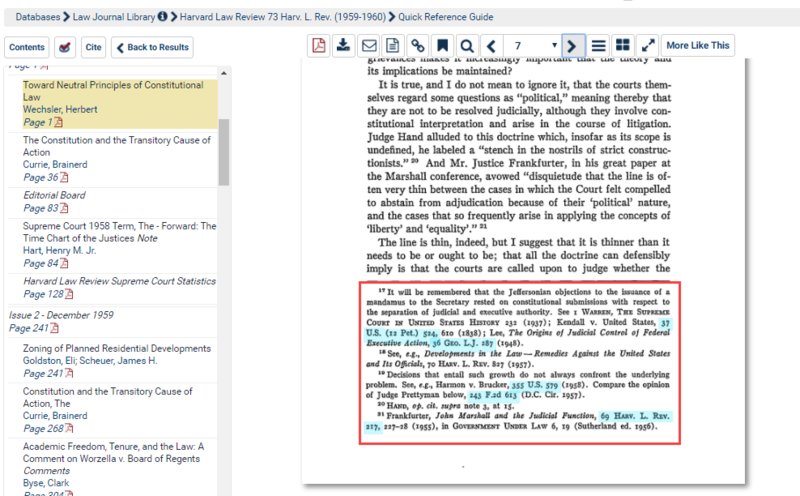 Click blue highlighted inline hyperlinks to quickly navigate between documents in both Fastcase and HeinOnline as well as to access external sites using these links. NOTE: Case law features are available for Fastcase Premium subscribers. 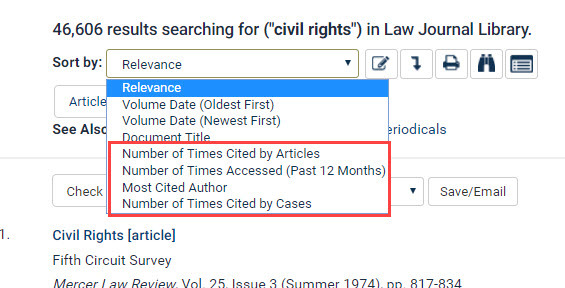 ScholarCheck enables you to sort search results by any of its metrics: number of times cited by articles, number of times cited by cases, or number of times accessed by other HeinOnline users within a rolling 12-month period. 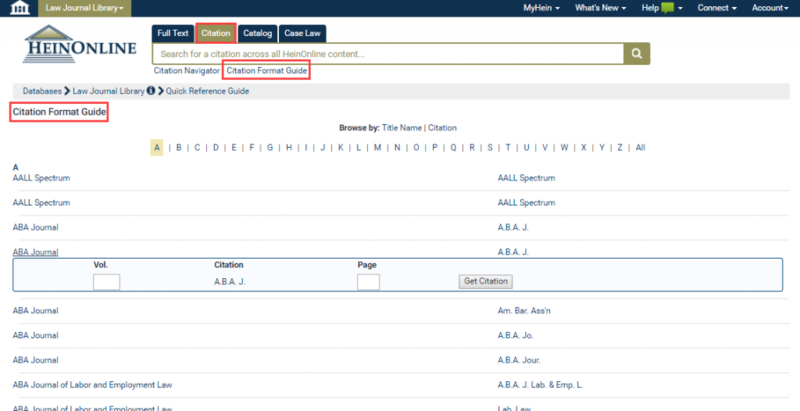 From both search results and from within HeinOnline and Fastcase documents, easily link to lists of articles and cases that cite the current article. Users may also view how many times the article has been accessed by other HeinOnline users within a rolling 12-month period. This helps the user retrieve the most accurate and relevant search results, as well as to see what’s trending in legal research. Look for the red PDF icon to instantly download an article. Use the download icon to access other print/download options, which include the ability to download only certain pages or to use a QR code reader to save a document to your mobile device. The email tool will send a direct link to an article to another person who does not need to be authenticated to HeinOnline to access the material. If need help navigating in HeinOnline, contact our dedicated support team at (800) 277-6995, email us holsupport@wshein.com, or live chat with us!